In this video I have talked about two important topics which are basically part of Time Speed and Distance. They are Escalator and Circular tracks. First I have explained what Escalators are and what type of questions are asked in it. Escalators are basically automatically mechanised staircases which we most commonly see in Shopping Malls and Airports. If you have never seen an Escalator please have a look at the picture below. Question 1. Raman is walking up an upward moving/ascending escalator. He covers 50 steps and reaches the top after 25 seconds. 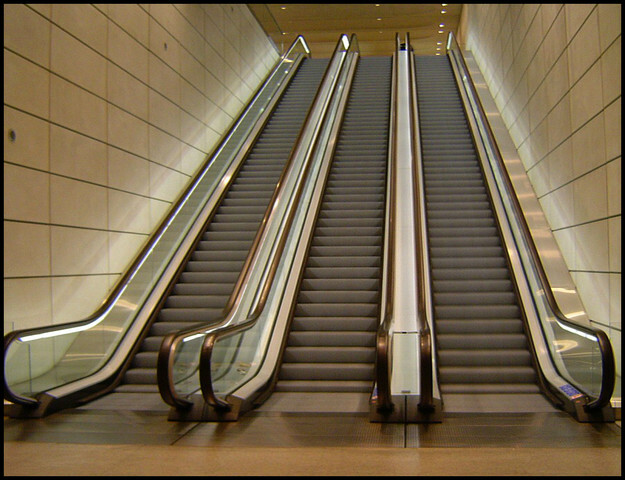 If the escalator comprises 200 steps, what is the ratio of the speed of Raman to the speed of the escalator ? Question 2. Rohan takes 15 seconds to climb up stationary escalator but 12 seconds when the escalator is moving. If the speed of the escalator is 2 steps/second, how many steps are visible at a particular point on the stationary escalator ? Question 3. Ram can climb an escalator in 15 seconds and can come down the same escalator in 25 seconds. How much time would he take to climb up and down the same escalator when it is stationary ? Question 4. A person walking down an escalator takes 26 steps and it takes him 30 seconds to reach the bottom. The same person while running takes 18 seconds and 34 steps to reach the bottom. How many visible steps are there on the escalator ? Question 5. An Escalator is moving at 3 steps per second. Rohan walking in the same direction as the moving escalator at 2 steps per second takes 3 seconds less to get out of the escalator then when he was moving on the stationary escalator. How many steps are there in the stationary escalator ? Question 6. On a circular track of length 1200 meters, X and Y are competitors. They start from the same point with the speeds of 27 km per hour and 45 km per hour respectively. Find when will they meet again for the first time on the track when they are running (a) Same Direction (b) Opposite Direction. Question 8. If in the above question, Ram and Shyam run in the same direction while Varun runs in opposite direction then find the same answers. Sir can you upload the videos of clocks?